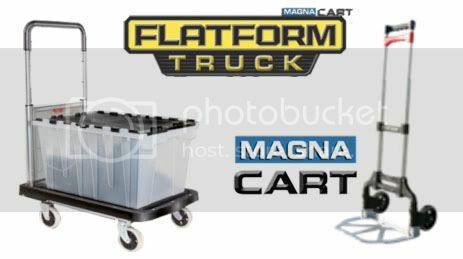 Like every Magna Cart™, it opens instantly with the touch of one button and stores wherever and whenever you need it to. Use it at home to carry in the groceries, at the office to move heavy reams of paper, cases of water, plants and general files and boxes or on a trip to when help with multiple pieces of luggage is needed. The Flatform Truck™ provides the stability of 4 wheels – requiring no balancing of loads. It has 6x the carrying surface area of our 2-wheeled models….yet compacts down to only a 3.2” wedge profile – suitable for storage anywhere. Lastly, it’s 300lb payload is a boon for heavier and larger loads, yet like no other 4 wheeled platform truck, it is 100% assembled and ready for action the moment you require it. The Flatform Truck™ is available at leading retailers, resellers and e-tailers across the US and the world. © 2010 Welcom Products, Inc.